For some people, their experience of recording sound starts with making wedding videos or recording other live events. As a sound recordist, you’re there to capture whatever is happening, as best you can. Getting better sound under those conditions usually involves better equipment, or making better use of what you’ve already got. But not all shoots are like that, and it’s easy to fall into the trap of thinking that’s the only way of working. What I’m saying is that whenever you can have any control over your environment, you should try to make use of it. Directors and cameramen don’t make things easy. Sound is rarely seen as being as important as the pictures, and the soundman is well down the production hierarchy, so you have to try to be assertive (but tactful). 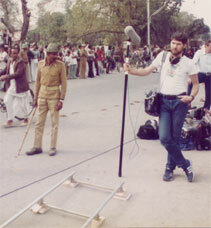 With few exceptions, no-one else on location actually listens to sound objectively. The human brain is remarkably good at rejecting unwanted noise when it suits us, and locations are usually chosen on the basis of how they look, not how they sound. Camera lenses offer 100% rejection of anything out of shot, but microphones don't, no matter how directional. So don’t just accept shooting in a noisy location without exploring the alternatives. Sometimes it’s sheer laziness. The camera gets set up somewhere for no better reason than because it’s outside the front door or next to where the car’s parked. The lighting’s OK and there’s a reasonable view in the background, but there’s a busy road nearby. Now if the road is in shot and it’s the reason for your being there, there might be some justification for staying near it, but usually it isn’t. You can be lazy too, go with the flow, and end up with a noisy sound track. Or you can look around for somewhere quieter, maybe behind a building, or simply further away. With very high frequency signals like light, which travels in straight lines, you can use a simple object like a “french flag” to keep the sun off the front of the lens. Blocking out unwanted sound from a microphone is not so easy. The much lower frequency of sound means that it tends to flow around objects like a fluid, so is pretty hard to stop. The lowest (bass) frequencies can also pass through solid objects, like partition walls, with surprising ease, as anyone living with teenage children will probably attest to. If there’s nothing to act as a large solid shield to reduce the level, then distance is the next best defence. Whatever you do, don’t forget the rest of the crew. Suggesting that you all walk 100 yards across a muddy field to get somewhere quieter might not go down too well, so look for somewhere that offers a better recording environment with minimum disruption. Bear in mind the needs of cameraman too, so that they can still get the sort of background they want for their shot and not lose whatever light they had because of moving location. In short, to come up with suggestions that are going to be accepted, you have to be aware of everyone else’s requirements because you can’t necessarily expect them to be aware of yours. Sometimes, nothing is going to work. For example, if you’re asked to record an interview with a group of little kids with nervous, quiet voices against any sort of background noise, in a wide shot, with the mic out of shot, forget it. If it’s going to work at all it would probably need to be on a hand-held mic an inch or two from the speaker’s mouth. Sometimes even that isn’t enough. If you watch motor racing, you’ll have heard how interviews in front of the pits can be completely drowned out by engine noise even when the interviewee is shouting into a mic held right in front of him. Background noise isn’t the only enemy you have to deal with. The acoustics of the environment are often just as significant. Rooms with hard walls and few furnishings have distinct resonances and small rooms can sound particularly “boxy”. Whilst this sort of sound can be quite desirable in creating a realistic “small room” atmosphere if that’s the intention, usually it isn’t. Often part of the sound track will be used with different pictures which don’t depict a “boxy” room. When used in this way, it’s best if the sound has no discernable acoustic traits which link it to any particular location. In post-production, you can mix in any sort of reverb to an existing recording, but, like paint, you can’t un-mix reverb. Voice-overs are recorded in a studio or acoustically treated sound booth for this very reason. On location, you can do worse than aim for the same sort of “dry” sound as you would get in a studio. You won’t normally get it, but there’s no harm in aspiring to it. So don’t just accept a location with poor or inappropriate acoustics without a fight. Go for a walk around the immediate area and see if you can find somewhere better. Clap you hands and listen to the echoes and for any “ringing”, which is where your clap turns into an identifiable tone as it decays, rather than a random “shash”. The less echo of any sort, the better, but ringing at any frequency is particularly undesirable because the sound level will momentarily peak every time that resonant frequency is generated. If you can’t find somewhere that sounds better, look around for objects which can give you some control. Draw any curtains that you can do. Soft objects are best at absorbing sound, but anything that will break up parallel surfaces can help. Set everything that’s movable at different angles and not directly against walls in order to break up the resonant sound reflections. In an ideal world you only need one microphone. You simply move around until you hear with your ears what you want to record and that’s where you position your mic. Sometimes, you really can do this. In the great outdoors, well away from machinery and reflective material, there is virtually no background noise or reverberation. When people are further away, they are simply quieter. When you turn up the gain all you get is more volume, not more background or acoustic colouration. If you’ve never experienced it, take your sound kit on a trip to your nearest wilderness and try it. Not only does everything sound great, but it’s so much easier to work under those conditions. And when you’re back on a normal shoot, remember it as a benchmark for what can be possible, the closer you can get to recreating those conditions. If you want to record better sound then don’t record what you know is going to be bad sound. Just say, "No"! It’s not as hard as you may think. It’s easy to feel when you’re asked, “Is this OK for sound?”, that you’re being asked “Are you up to the job?”, and the natural response is to want to say "Yes". But another way to look at it is to imagine they’re saying “Look, we haven’t actually planned this properly and we might just be giving ourselves problems later, so are we going about it in a sensible way?”. Usually you can say, "Yes", but even with all the kit in the world your best answer should sometimes be "No".
" I've been a regular contributor to user groups and technical forums for the last 20 years or so, and have written hundreds of posts offering advice and information on a whole range of computer, audio & video production topics." What we're about . . . ZEN is not a traditional Audio-Visual dealer who started selling computers, nor is it a computer shop that also sells video products. You won't get any salesmen giving you the "hard-sell" when you call, just straightforward advice and information - which for some callers is the knowledge that they don't need to buy whatever it is they thought they needed! Above all you'll be dealing with someone with a wide range of experience and knowledge of both PCs and video production. We're not the biggest, nor necessarily the cheapest, but we are one of the longest established computer/video specialists in the UK. Company history . . . ZEN was started in the 1980s by Martin Kay, then working for ITV at Granada's Manchester studios, who built his first 6502-based computer in 1979 from an Ohio Scientific kit, bought in the USA whilst working as a Sound Recordist on a film shoot for World In Action. With the advent of the Amiga, which could be gen-locked to a video source, Martin started writing a variety of video-related software. This included subtitling & tele-prompting, ident clocks, scoring software for sports & gameshows, and specialist software to mimic other computer displays for use in TV film dramas like Cracker, Prime Suspect and A Touch of Frost. Martin left Granada in 1993 to concentrate on his computer-video activities with ZEN, following a natural path into non-linear editing systems, for many years the main business activity, although he still maintains an active interest in video production. Copyright © 2010 Zen Computer Services.